Hello to Climate Action supporters. For those who haven’t heard Our Convenor Ann O’Brien has resigned to take up a position in Sydney. We all would like to congratulate Ann and thank her for her hard work over the last few years and wish her all the best in her new job. The Australian Capital Territory government made history on Thursday by setting greenhouse gas reduction targets of 40% by 2020 and 80% by 2050 based on 1990. This milestone level is the most ambitious of any Australian state. Kitchen table campaigning to express community concern and support for tackling climate change has put the wind in the sails our political representatives. Canberra’s future is looking cleaner, more ethical and exciting. The Love Forty Percent campaign achieved all it has lobbied for over the past few months. Congratulations all the organisers. Love it. We won and now move onto the next stage of this campaign. major parties endless delay on really achieving anything substantial about the climate emergency or making a credible greenhouse policy. Hooray for all we have achieved. Along with the SEE-Change stall at Floriade this year, they will also be presenting 6 different seminars throughout the week starting on the 20th of September. Each presentation covers a specific topic and will run for around half an hour. This is a great opportunity to support SEE-Change and learn about some interesting ways to reduce your environmental impact. The presentations are listed below in Events section. Canberra ♥ 40% Meeting Monday 30th August at 6.30pm. Once more with feeling: Principles for reducing greenhouse gas emissions and improving the well-being of most Australians. -(attached to this newsletter). Despite much of the election being allegedly fought on ‘economic management’ neither the ALP nor the Coalition were asked to explain how it was that they simultaneously claimed to be ‘good economic managers’ yet were determined to ignore all economic evidence about the best way to tackle climate change. This election has shown just how much of a challenge new issues such as climate change are for old political structures. This paper spells out the economic principles that should underpin an effective, efficient and equitable approach to reducing Australia’s greenhouse gas emissions at the lowest possible cost. In addition, it also provides evidence to support the claim that the introduction of a carbon price would benefit most Australian families. Put simply, the collection of a carbon tax should not be seen as a cost to the economy but a redistribution within the economy. If the proceeds of a $25 carbon tax were provided directly to Australian households rather than returned directly to the polluters a family of four could be paid a ‘carbon dividend’ of $2,100 per year. Other options for how the revenue from a carbon tax could be spent include lowering the Goods and Services Tax (GST), lowering the company tax rate, investing in renewable energy and other low carbon infrastructure. Always wanted to do your bit for sustainability but can’t get motivated? Not sure what you can actually do? Get a team together and join the 30 day sustainability challenge! You can do it with your housemates, your gym buddies, your classroom or your self. Put the poster up on your fridge, write in the 5 things you’ve chosen for a more sustainable life, and track how you’re going over the 30 days of the Challenge. There’s a spot for you to write in how you’re going, what’s worked really well, and what hasn’t worked at all. At the end of the 30 days, send it back to us and we can find out the best ways for people to reduce their impact on the environment and help more people do the same! Writing a letter a politician is a way that you can make your representative/s aware of the existence of an issue or to promote your view on an existing issue. This document (http://love40percent.org/how-to-write-a-letter-to-an-mla/) focuses on letter-writing as part of a broader strategy to build community and political support in the ACT for a 2020 greenhouse gas emissions reduction target of at least 40 per cent. Download the attached letter-writing tool kit and start writing. Calling all woollen artists. We need your help to make a giant woollen banner for an upcoming event we have planned. If lots of people make a few small squares then we can sew it all together into something huge and wonderful. Email info@love40percent.org please drop off knitted squares at the conservation council at 17 Childers St, Acton and/or mail them to “Love 40% c-/ ACT Conservation Council, GPO Box 544, Canberra ACT 2601″. If you are particularly keen you could try knitting some patterns or messages Go to .http://love40percent.org/2010/05/knit-against-climate-change/ for a heart shaped pattern to get you started and a discussion forum. Beyond Zero emissions has released their plan for 100 per cent renewables in 10 years. The Zero Carbon Australia Stationary Energy Plan, showing the feasibility and affordability of 100% renewable energy for Australia is now out and popping up all over the place. Help it go viral by getting yourself an electronic (free) or hard-copy ($30) and sending it to family, friends and colleagues. We can only shift the debate on energy and climate in this country by breaking the many myths that the public holds true about renewable energy and fossil fuels. Click here to download or purchase the plan. 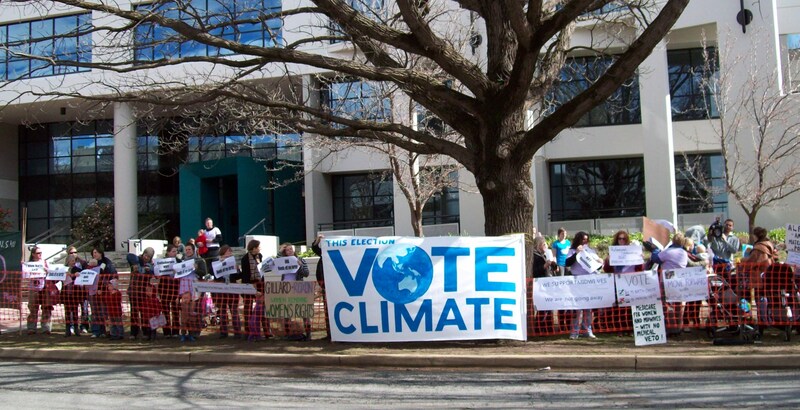 .ACT campaign for 40%+ Emissions Reductions by 2020. Molonglo Valley Development – these new Canberra suburbs currently being planned. We need to act fast to get strong environmental standards on public & bike transport, passive solar homes and management of the river to ensure there is no dam,but a chain of ponds. Arts Action for Climate. Calling all types of artists. Be quick to get a place on the last of this years winter season tours of Canberra’s Sustainable House. This inner Canberra home showcases the very best in sustainable housing, appliances and lifestyle. A fabulous way to gain ideas to make your own home sustainable. Canberra’s Sustainable House also offers an advisory service for householders who need assistance or coaching to reduce their energy, food and water expenses. A tour is a great way to begin this journey. “Biodiversity and World Food Security: Nourishing the Planet and its People” will be held in Parliament House, Canberra over the period 30 August to 1 September. This will be the key event in the Australasian region and one of very few international events focusing on food security imperatives in relation to biodiversity conservation. The conference will highlight the value and vulnerability of biodiversity in agriculture, food security and rural livelihoods, especially for developing nations and Australia; address the additional pressures that climate change impacts will bring to bear on both the conservation and use of biodiversity, and offer some policy directions for Australia and the developing world. What impact will the debate over sustainable population for Australia have on our existing cities? The conference will examine how our new cities are conceived and our existing ones are adapted, re-designed and managed. Where is it On? : National Convention Centre- Canberra. Evolutionary biogeography seeks to uncover patterns of biological diversity and to understand how evolution, in response to environmental change in time and space, has generated these patterns. Given rapid global change due to human activities, it is both relevant and urgent to combine evolutionary principles with environmental data to predict hotspots of endemism – biologically unique areas – and to understand how they developed and persisted through periods of past climate change. In this talk, Professor Moritz will outline some general principles and illustrate their application, focusing on case studies in tropical rainforests of Australia and Brazil. The results suggest new approaches, combining spatial modeling and molecular phylogeography, with potential to improve biodiversity prediction and conservation planning in as yet poorly understood, biodiverse regions of the planet. 2nd September, How do we manage terrestrial and aquatic biodiversity on private land? Australia’s national strategy for biodiversity conservation is mostly concerned with the protection of ‘wild’ biodiversity from unsympathetic land use. This strategy both ignores the provision by biodiversity of ecosystem services that underwrite the sustainability of land-based industries and subtly shifts public understandings of the rights and responsibilities towards resource condition that inhere in private property rights. Biodiversity has no respect for demarcations between agencies and portfolios, the lines on maps of land tenure, specialisation of research disciplines, or the short times frames of forward estimates. Conserving biodiversity across landscapes and time severely challenges our current policy thinking and capacities, but recent research and practice are indicating some positive and practical ways forward. Go to this site to find out how. The second annual Canberra EV Festival will be held on Saturday, 18 September, 2010, and the Canberra branch of the Australian Electrical Vehicle Association hopes to make it bigger and better than last year’s! In partnership with The ACT Electric Vehicle Council, they are planning an exciting event: they will have representation from both commercial organisations and private individuals as well as talks explaining what electrical vehicles are and how you can make one! SEE-Change will be holding 6 presentations at Floriade this year! Along with the SEE-Change stall at Floriade this year, they will also be presenting 6 different seminars throughout the week starting on the 20th of September. Each presentation covers a specific topic and will run for around half an hour. This is a great opportunity to support SEE-Change and learn about some interesting ways to reduce your environmental impact. The presentations are as follows: Monday 20th September11:30am – 12:00pm: Lish Fejer from ABC TV’s Carbon Cops and Green it Yourself (GIY) will present “Global Worming”. Lish will show you how to set up your own worm farm (or salvage a smelly slimy one) and microbe-munching unit that will turn your kitchen scraps into delicious nutritious garden fertilizer. 12:00pm – 12:30pm: Shirley Pipitone will be presenting “Good Morning Sunshine – My Retrofitting Experience”. Shirley will be speaking about her experiences retrofitting her home to make it more sustainable. 11:30am – 12:00pm: Jane Cottee, Education Manager from Building and Environment Centre at CIT will be presenting “Drought Tolerant Gardens”. Jane will be speaking about how to create drought tolerant gardens in Canberra’s current climate inlcuding plant selection and water saving strategies. 12:00pm – 12:30pm: Leigh Duxson – “Envisaging 2030“. Leigh will be speaking about how we can envisage Canberra in the year 2030. 10:30am – 11:00am: Simon Gemmell from Capital Aquaponics will be presenting “Aquaponics – growing vegetables and fish!”. He will teach you how to grow your own fish and vegetables for consumption in your own backyard! 11:30 – 12:00pm: Jeff Knowles will be presenting “Sustainable Homes”. Jeff will be speaking about how to build sustainable homes within the ACT. The government of an Australian territory said on Thursday it will enact tough carbon cutting laws, a step that comes after a national election that punished the ruling Labor party over lack of action on climate change. Future oil prices will determine whether a biofuels industry can succeed in Australia, experts say. Grant District Council Mayor Richard Sage says there has been no consultation about a proposed wave-energy plant at Port MacDonnell. The Land and Environment Court has upheld an appeal against a $150 million wind farm at Glen Innes. The Land and Environment Court has upheld an appeal against a $150 million wind farm at Glen Innes, in northern New South Wales. Northern Energy Corporation says the Queensland Government’s proposed changes to agricultural land zoning would not impact on its planned Colton mine, near Maryborough. Cougar Energy says it is at a loss to explain why the State Government has rejected its environmental evaluation of the Kingaroy UCG plant. The fossil record from oceans around New Zealand shows a sudden discharge of carbon dioxide into the atmosphere at the end of the last ice age. Motorists at the bowser will start seeing a new type of fuel that is 20¢ a litre cheaper than petrol, but bargain hunters be warned: it could ruin your engine. No more ‘politics as usual’ should mean having enough courage to tackle the sickness of mindless consumption. Hopes surged this week that a swing to the Greens will result in meaningful action on climate change in the new Parliament. THE NSW Government’s solar bonus scheme, which pays householders for the electricity they generate from their rooftop panels, has proved so popular it has reached a 50-megawatt milestone 18 months before expected. ROOFTOP solar cell projects are on hold because a State Government review of how people are paid for the electricity they create has never been released. A geomagnetic storm (or solar storm) is a temporary disturbance of the Earth’s magnetosphere caused by a massive solar flares or related sun output. A geomagnetic storm is caused by a solar wind shock wave which typically strikes the Earth’s magnetic field 3 days after the event on the sun. The effect on the earth can be small or it can be large. Astronomers are predicting that a massive solar storm, much bigger in potential than the one that caused spectacular light shows on Earth earlier this month, will strike our planet in 2012 with a force of 100 million hydrogen bombs. This is far larger than average. Millions of dollars worth of income could be unlocked for poor farmers in developing countries by changing existing policies that reduce investment in agroforestry. An Agroforestry Policy Initiative, involving a wide range of partners, would make agroforestry a key contributor to ensuring food security, reducing poverty and combating climate change. Could roads surfaced with solar panels bring renewable energy to our doors? Analysis: Climate Aid Reaches $30 Billion Goal, But Is It New? Aid promises from rich nations to help poor countries slow global warming are reaching the $30 billion goal agreed in Copenhagen but analysts say much of that is old funding dressed up as new pledges. The European Union’s top climate official proposed on Wednesday new limits on the use of carbon offsets from industrial gas projects, under fire by green groups, in the EU’s emissions trading scheme after 2012. Royal Dutch Shell Plc said on Thursday it was starting up a demonstration project to test a new method of speeding up reclamation of toxic waste ponds at oil sands operations, a source of tension between oil companies, environmentalists and regulators. Chile and France’s GDF Suez have agreed to relocate a planned $1.1 billion thermal power plant, following a public outcry over fears the project would harm a reserve that is home to endangered penguins. You received this message because you are subscribed to the Google Groups “CAC-Announce” group. To post to this group, send an email to cac-announce@googlegroups.com .